This is a project that i just finished that is relevant. Associated spreadsheet unfortunately not live but at the optimized state for NPV. The scope of this project is a one house system, through other houses could be easily added, and only looks at electricity production. Only current off the shelf technologies are looked at, no prototypes or possible systems are included. 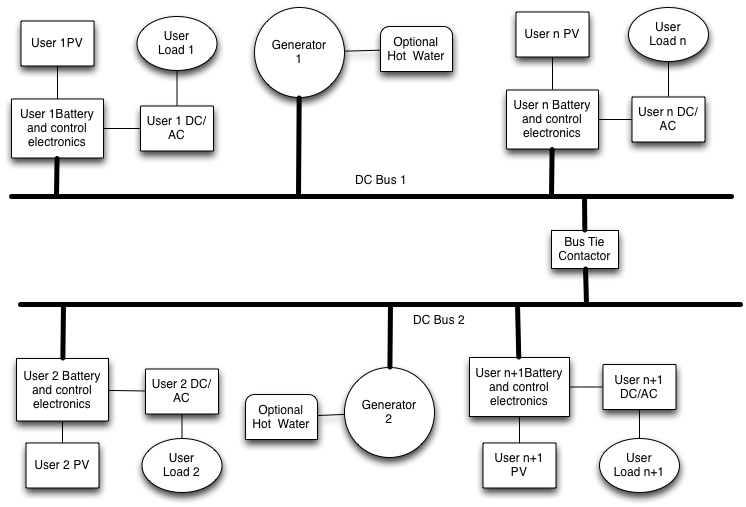 This project is looking at the optimisation of a microgrid that is only powered by diesel fuel or solar PVs. Solar panel model. What can be changed is the number of solar panels. Battery: Stores excess electricity produced by the generator or PV panels and allows it to be used at a later time than when it was produced, normally night-time. Lilley, B; Satzow, A; Jones T; (2009) ‘A Value proposition for Distributed Energy In Australia’ CSIRO. WholeSaleSolar (2013). "Deep Cycle Battery Banks." Retrieved 10/10, 2013. Winaico (2013). "Technological leader: WINAICO QUANTUM." Retrieved 10/9/2013, 2013. Decker, K. D. (2009). "Small windmills put to the test." Retrieved 10/10, 2013, from http://www.lowtechmagazine.com/2009/04/small-windmills-test-results.html. The reason we are looking at microgrids is because they offer advantages that are useful for a wide range of people in pursuit of various goals. Below is a sample of those advantages. 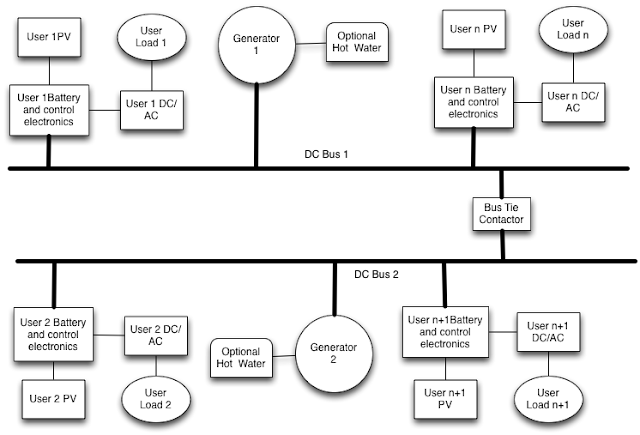 Like anything, microgrids also have their disadvantages that make them unsuitable for all uses. Below is a list of some of those disadvantages. Since this system is designed to be owned and operated by the average Australian, its requirements are geared towards that sort of situation. Price is important, along with usability and it’s a functioning investment that needs to provide some sort of return. The system shall provide hot water and electricity at an equal or greater rate than the client’s need, when they need it. Each of the various element falls under a different category: those that can be changed (variables), limits to the model (models), the outputs of the model and options. If optimising for NPV, 43 solar panels is the optimal choice as it has the lowest NPV. Importantly, lowering the load decreases the advantage of going off grid, at 15Kwh it is better to stay connected to the grid. This suggests that adding more houses to the microgrid will further increase the advantage of going off grid, especially if those house have a low electricity usage. In that case this model simulates 3 houses of 8 Kwh load each fairly well and as long as the battery is about one days storage this approach is accurate. Importantly, this model shows that reducing the battery size as much as possible is the optimal solution. But since calculations are done at a daily basis, when the battery gets below a day’s storage the model will be inaccurate because night-time electricity use isn’t accounted for. If calculations were done an hourly basis, then the day/night cycle can be taken into account and the variation of load over the day can be simulated, then battery storage can be lowered below a day’s storage without the model losing accuracy. This is the prime reason I choose an off the shelf battery, optimising the exact size by buying individual batteries isn’t an option supported by the current model. The main component missing from the model is heat storage and hot water for space heating. This is actually a separate task that then informs the main model. It is also where the optimum number of attached houses (and thus final load) is likely to come from, more houses means a bigger heat storage tank but also more heat loses in moving the heat around. Having heat storage also allows the excess power produced in the summer months to be used rather than wasted, it can simply power an electric heating element or heat pump. The heat storage would be modelled like the battery, except that storage lose is added, a certain amount is needed and if there isn’t enough the diesel generator is run for longer. In most cases, the diesel generator won’t be run that much more than it already is but when it does it will provide extra power. This power can again be used by electric heating elements to store heat for tomorrow. Heat for other uses can be added, but this is more complicated since hot water use for showers varies widely with households.